I really like the phrase “living forward into history,” partially because I coined it (I think), just after September 11. To me, it means that at every great juncture in world events, no one standing at that juncture knows what is going to happen, how the whole thing will turn out, or even that they are at a juncture, yet they keep right on making the large and small choices that will shape the future. It is easy for readers of history to forget that with the hindsight their knowledge gives them. (And it depends on whether George Santayana or Karl Marx’s take on history is right.) It also means that readers of history should have a greater measure of sympathy for people who don’t recognize the extraordinary times in which they live. Anyone who reads Alan Furst is continually reminded of the second. The Foreign Correspondent is set in Paris in 1939. Italian journalist Carlo Weisz, who left Italy during the rise of Mussolini’s Fascists, is now working for Reuters, covering the Spanish Civil War and regional dog shows, or whatever assignment his relaxed editor sends his way. Weisz is also a contributor to Liberazione, an underground newspaper smuggled into Italy to counter Fascist propaganda. Paris is not a safe place for expatriates, as demonstrated by the murder of Liberazione’s editor, but Carlo agrees to take his place. In this new function he is approached by both the French police and British intelligence, who seduce him into serving their interests. Carlo is not without his own guile, though, and in return for his efforts on their behalf makes his own demands for both personal and patriotic gain. The dramatic tension of the story lies in the way Carlo treads the ethically murky path that he must follow while still maintaining his individuality. For the modern reader, there is also the tension of calendar pages turning over as we move towards September 1, when Hitler’s army crosses into Poland and ignites the war in Europe. Carlo’s profession allows Furst to move him through pre-war Europe, so the reader gets a glimpse of life in several countries – the disillusionment and weariness of Spain at the end of the Civil War, the mass hysteria and righteous certainty of Nazi Germany, the cheerful anarchy that gave the Fascists fits in Italy. Everywhere he goes, though, there is a sense of clouds gathering, of Hobson’s choices confronting ordinary people, and of the futility of trying to individually oppose an onslaught of state power. While Furst’s stories don’t have the action of a Robert Ludlum or the claustrophobia of a John le Carré, they occupy an important place that make them stand out from the rest of the espionage fiction crowd. His characters aren’t heroes, but they have the faculty of caring about something beyond themselves and their own safety. They take risks to serve their ideals, with a very real knowledge of the consequences of failure, and they try to search for and preserve the individual relationships that bring them a measure of happiness. At the same time, unlike the reader, they have no knowledge of the cataclysm that is about to engulf their world. Furst makes them live forward into history, and that’s the real power of his writing. Four days about birds, 2 books, 2 movies and I was all set to write about another bird book when I took a bribe (iced coffee is a wonderful bribe for me) to not write about birds to end the week. So let’s move on and forget about the birds and change the focus to: No Talking by Andrew Clements. Clements, a former elementary school teacher has been writing books for children for years and has become a household name since the publication of Frindle in 1996. No Talking was published last year I have read this book aloud to 2 separate groups: A summer school group of children at Norge Elementary School and my daughter’s 5th grade class this year at Clara Byrd Baker Elementary School with great results! Dave Packer is researching a school report on India and while he is preparing for his oral report he reads that Gandhi practiced not talking one day a week to clear his mind. Dave decides he can do that as well and the novel is set moving. Dave forgets his one day promise to not talk when he over hears a girl in the lunchroom and the two set up a competition: Boys against the Girls, No Talking for Two Days. Mr. May’s 5th grade class held the same competition around Thanksgiving, the boys claim the girls cheated (I wouldn’t have expected anything different) but the girls won…but who is the winner in the novel, and more importantly what lessons are learned? Breath taking and remarkable close up cinematography places you in the center of the flight patterns and along the nesting sites on cliffs and the sandy beaches as the film crew spent nearly 4 years filming from all corners of the earth. The near lack of narration, I thought was perfect for the film, although some have disagreed with me. I did not think this film needed narration, on the other hand, I thought Morgan Freeman’s narration of The March of the Penguins was the bee’s knees and a film that needed that narration to be complete. As I watched the film I was shocked that the birds would not shy away from the filming crew, only to learn that flocks of the birds bring filmed were raised and imprinted on the film crew for this film. So this film is not quite a documentary, not quite fiction, but somewhere in between. (But not at the level of This is Spinal Tap). Did watching the “making of” change my thoughts on the movie? Yes and No. I still thought the movie was great and I was fascinated by the story, but I was disappointed in the “imprinting” aspect. My daughter felt a little lied to after watching the “making of” bonus feature. I can understand her point of view, now it’s your time to decide. When Melanie Daniels rolls into Bodega Bay in pursuit of eligible bachelor Mitch Brenner, the small California town is inexplicably and viciously attacked by thousands of birds. Of course we know birds to not attack people, but that’s ok…let’s suspend belief and look at this wonderful Hitchcock film that was recently thrown back into the spotlight with the death of Suzanne Pleshette. Rumors about bird care during the filming still persist today, I have read that magnet and fishing line were use to keep birds on phone wires and on roofs, also the use of birdseed in the hair of actors as well to promote the “active feeding” on the characters. 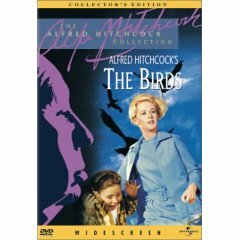 I’m sure Hitchcock would have animal rights activist lurking around if the filming was today; be that as it may, sit back and enjoy the terror of The Birds, and look for Hitchcock walking his dogs for his cameo. As I selected categories for this entry, I wondered is this movie a “classic”? I know we talked about birds yesterday, but that was birds during one year, this is birding over a lifetime. Dan Koeppel tells the life obsession of his father, an extreme birder, one of the few persons in the world to have seen over 7000 species. Only from a lifetime commitment can you see such a high number of species; special vacations and travel arrangements, effort, money, strategy, and knowledge all play a large part of this lifelong compulsion. Richard Koeppel wanted to become an ornithologist, but after much pressure from his family he decided on a medical career, a career that has allowed him to travel the world in search of birds. A quick read that opens the birding world to everyone. The history of birding, rules and technicalities of creating a lifelong big list, and even the taxonomy of birds are examined. A closer look at the deteriation of the American family, this one torn apart, not from drugs or alcohol but from the natural world is also revealed in this gem of a book. Recently in Williamsburg there has been an unusual sighting of a rare bird in the area, a Townsend’s Solitaire. I came across a handful of folks that made more than an hour’s drive to see this western, Rocky Mountain native; folks from Charlottesville, Roanoke and even the brave folks that came through the Hampton Roads Bridge Tunnel on a weekend from Chesapeake. Luckily my daughters and I had to drive about 3 miles to see the bird. The Big Year by Mark Obmascik details his “Big Year”(a birding term) that birders use to define a year long contest to see who can identify the most species during 365 day period. Obmascik also relates the year long obsession of other birders during 1998, how they cross paths, help each other and he even dabbles in the environmental and societal issues for birders as well. At break-neck speed the story unfolds, from the western islands of Alaska to the keys in Florida birds are identified and checked off the list only to finally award the Big Year champion in December. The trials, triumphs and frustrations of these three birders make this book a wonderful read for non-birders. If you are driving to see other rare species and don’t have the time to read the book, the Williamsburg Library offers this selection on audio cd as well. The Audio version was an Audiofile Earphones award winning selection. 2008 is THE BIG YEAR in my household, my oldest daughter and I are keeping track of the different bird species we see this year, and the Townsend’s Solitaire is one that I never would have guessed we’d see near the coast of Virginia. Noted baseball analyst Bill James, best known for his Baseball Abstracts, turns his keen eye on the Baseball Hall of Fame in this diamond of a book for statistical junkies and baseball enthusiasts. I first read this book right after Phil Rizzuto was elected to the HOF and clearly remember the controversy with his election and comparison to other players of his time. Rizzuto clearly, IMHO, campaigned his way into the hall. James discusses Rizzuto as a player as well as turns his eye on the Veterans Committee headed by Frankie Frisch, who may have persuaded votes for Frisch’s old teammates. Pete Rose is not left out of the discussion and I’m waiting for a new updated look at the steroid era of baseball and it’s significance with future elections to the hall and immortality. The book was originally published in 1995, so there has been plenty to re-examine, but you can not go wrong in the detailed report of the players of baseball golden age and the players that my father grew up watching in Forbes Field and the players of my youth. Also published as Whatever Happened to the Baseball Hall of Fame: Baseball, Cooperstown and the Politics of Glory. If you enjoy this title, please take a look at Bill Ferber’s The Book on the Book: A Landmark inquiry into which strategies in the modern game actually work. From the cover: Whenever you hear an announcer talk about the unwritten rule or say that so-and-so is going by the book in bringing in a situational substitute, The Book reviews the facts and determines what the real case is. If you want to know what the folks in baseball should be doing.